Dubai, UAE, January 09, 2019: Winter in the UAE is the best time to get all cozy, sip on hot chocolate, and spend hours outdoors without the fear of being fried to a crisp. However, winter air poses a problem for your delicate skin and hair. While most of us tend to keep our skin hydrated and moist during winter, a lot of us don’t seem to understand how much our hair should be cared for, as those beautiful locks will get dry, brittle and damaged. Fortunately, your winter woes can be avoided by using products that are intensely hydrating. Hask’s Argan Oil 5-in-1 Leave in Spray, Coconut Water, and Cactus Water collections are such products that can prevent drab-looking, weak hair. These product ranges promise to intensely moisturize you locks, leaving you with luscious, bouncy hair, and no hair woes! Hask’s products smell incredibly fresh and are proven to be good for your hair, being free of parabens and sulfates. Coconut Water Weightless Volume Collection: Thirsty hair craving for some needed hydration? This range consist of a shampoo (AED 29) and conditioner (AED 29) packed with good-for-you electrolytes and anti-oxidants, known for its ability to replenish and recharge dead looking hair. It keeps hair hydrated all day long without excess oil or build up too! 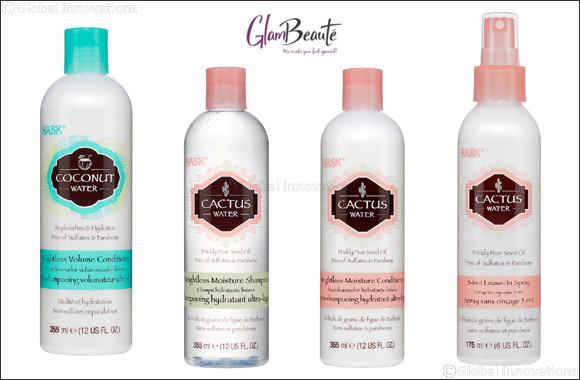 Cactus Water Weightless Moisture Collection: Cactus is known for its ability to retain large amounts of water and nutrients. Hask has bottled up this hair holy grail which includes shampoo (AED 29), conditioner (AED29) and prickly pear seed leave-in spray (AED32) to create an ultra-nourishing & hydrating range. Using this combination of products alone is enough to get you by the driest of winters. Argan Oil 5-in-1 Leave-In Spray: This lightweight and conditioning spray is a hair healing remedy for damaged hair. It’s perfect for layering with any other Hask products to achieve a shiny finished look. And the best part is it strengthens and restores your hair! In the UAE, HASK products are available at leading supermarkets, hypermarkets and online.